Quartz Composer Plugin to send/receive DMX512 data. Is there a better alternative to ArtNetTools? Is ArtNetTools really the best app in Network category? 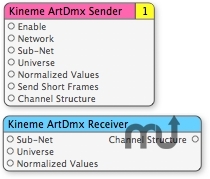 Will ArtNetTools work good on macOS 10.13.4? Improves standard compliance and fixes a few off-by-one bugs in channel mappings. It should improve compatibility with more Art-Net devices. ArtNetTools needs a review. Be the first to review this app and get the discussion started! ArtNetTools needs a rating. Be the first to rate this app and get the discussion started!